I had the extreme pleasure of appearing with Luca Brassy and Jill Camillo on the Brassy's World Podcast on Sunday, February 4, 2018. By all accounts it was a Super Showing - mainly because the competition for viewers and listeners included Super Bowl 52 between the New England Patriots and Philadelphia Eagles. But, you can hear the episode without distractions now through the archived link below. Luca brings Rich up at the 11:08 mark for a twenty minute interview. 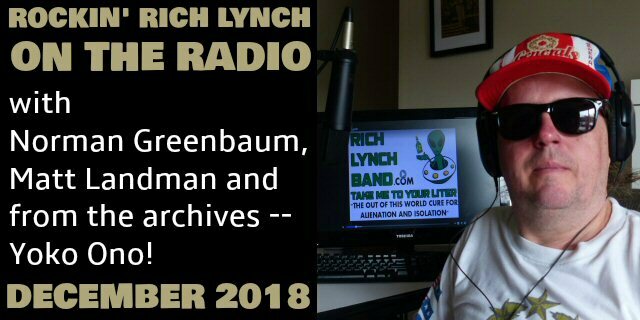 Rich is a music industry insider who has covered and photographed hundreds of concerts on assignment for the top labels and publicists in the business for the past 2 decades. He has interviewed many stars and legends such as Meatloaf, Zakk Wylde, Donovan, Yoko Ono, and more! He recently started his own recording career which is classic rock with a modern twist similar to Springsteen, the Stones, Tom Petty, etc. In 2018, he's promising his fans a "New Deal" to continue to record his music if they purchase one of the 14 records he has worked on so far. He has created a platfrom called onemilliondownloads.com to help with the process!